10 KW LINEAR AMPLIFIER X-5 - Peak power 12.3 K Watt in to 50 Ohm. high power into an 8 ohm load, be 2 ohm stable and drive 1 ohm speakers playing music not continuous test tones. The amplifier will use discrete circuits with no signal processing and will include a differential input stage, large bank of output stage transistors and have the ability to bridge two channels to create a single even more powerful monoblock amplifier. able to drive 2 ohm loads short term providing anywhere from 1200 watts to 1600 watts. work nice to create a cushion of safe operating area for the amplifier with a small penalty to output power. 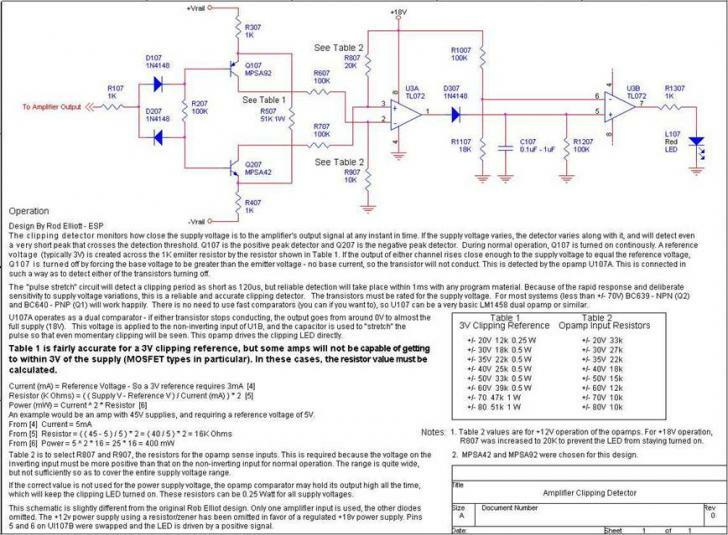 Anthony E. Holton wrote the original documentation to describe the AV800 amplifier.� Some of his documentation has been included here, but it may have been altered to reflect the Model 2800 printed circuit board and schematic.� You can refer to the AV800 construction manual for reference but the component reference designators on his documentation will not match the Model 2800 printed circuit board. 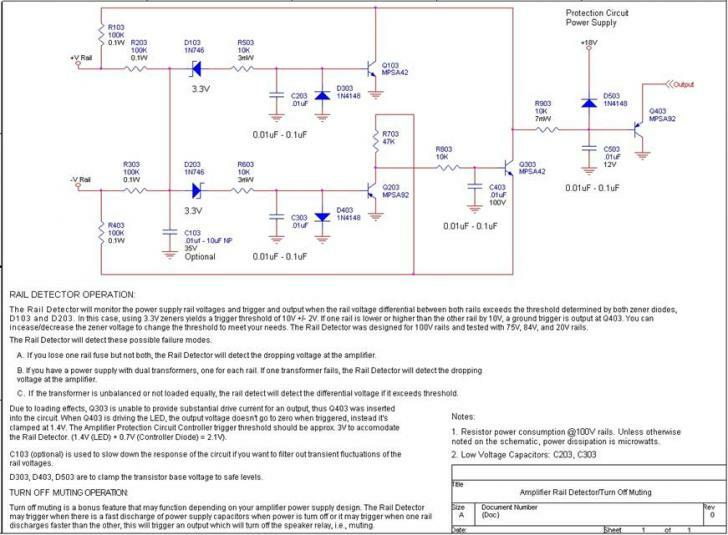 Use the schematic in this document. stage amplifier consisting of a differential input stage, voltage amplification stage, bias/buffer stage, and output stage.� The output stage consists of 7 output stage transistors per voltage rail (14 transistors per channel). loaded.� The output stage consists of 10 output stage transistors per voltage rail (20 transistors per channel). 1.� More output stage transistors, up to 28 per channel. 2.� More on-board power supply capacitance, typically 13,000uF � 28,000uF depending on capacitors chosen. 3.� More on-board �VAS� capacitance, typically 3,000uF � 6,000uF depending on capacitors chosen. 4.� Protection circuits including a programmable controller with soft start that drives a high current speaker relay. 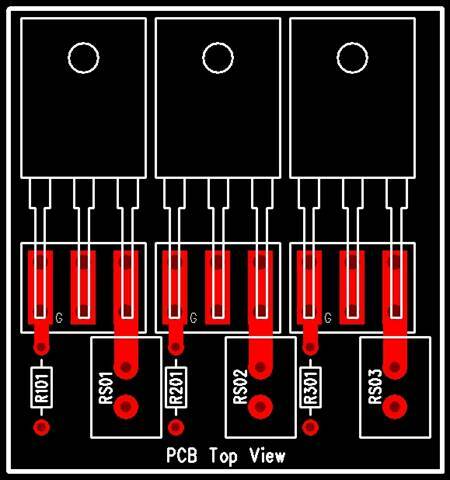 5.� PCB footprints allow the installation of high quality polypropylene capacitors. 6.� On-board beryllium copper fuse holders (clips) that support 30 amperes for each rail. 7.� Input signal terminal block (3 pin) for (+) input, (-) input and also has a center ground pin for esoteric needs. 8.� Molex connectors power input (6 pin) and speaker output (2 pin). Extra parallel pins for redundancy. 9.� Four layer printed circuit board layout with power and ground planes and power redundant tracks. allow 2 ohm continuous operation and perhaps 1 ohm music if adequate heatsinking is provided.� The output impedance of the buffer stage may need adjustment to drive the extra Hexfet transistors, it�s unknown at this time. 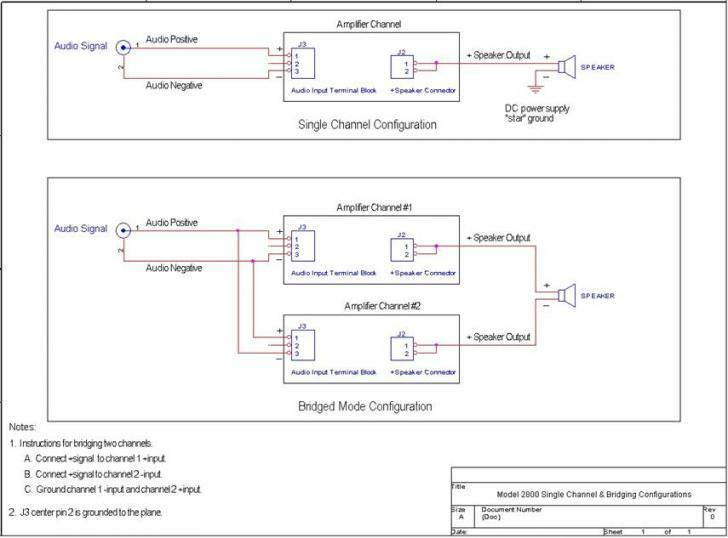 channel configuration is the most common where one Model 2800 printed circuit is one amplification channel. Connect the audio signal positive (+) to the positive (+) input on the terminal block. Connect the audio signal negative (-) to the negative (-) input on the terminal block. The terminal block center pin is grounded to the plane and may be used for esoteric needs such as shielding, etc. The speaker output Molex connector connects to the (+) speaker terminal. The (-) speaker terminal connects to the DC power supply �star� ground. 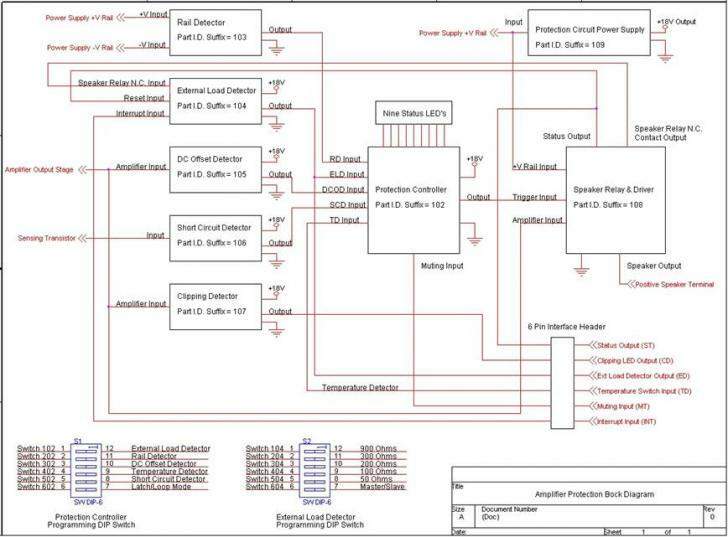 Refer to the �Model 2800 - Single Channel and Bridging Configurations� schematic for the wiring diagram. Bridge Mode is when you use two amplifier channels connected together to form a single channel of greater power than a� single channel, theoretically 4x more power, but typically 2x more power often referred to as a monoblock. Connect the audio signal positive (+)� to channel 1 positive (+) input and connect it to channel 2 negative (-) input. Connect the audio signal negative (-) to channel 1 negative (-) input and connect it to channel 2 positive (+) input. Channel 1 + speaker output connects to the + speaker terminal. Channel 2 + speaker output connects to the � speaker terminal. Main controller that receives input from the protection circuits. It also functions as an eight second turn-on delay to drive the speaker relay. This is an ordinary common dc offset detector. This is an ordinary common output short circuit detector. The printed circuit board accommodates AGC solder mount fuse clips. Beryllium copper recommended over standard tin type fuse clips. This input accommodates a ground triggered temperature switch configuration. Top Layer 1 - Component side, power and ground tracks, alternative routing. Inner Layer 2 - Speaker output plane, protection circuit power supply plane. Inner Layer 3 - primary power & ground plane, ground barriers to steer ground currents. Bottom Layer 4 - Primary amplifier signal routing, power and ground tracks. 2. Material: 125 mils thick epoxy-fiberglass, grade FR-4. 5. Top layer silkscreen using white non-conductive CAT-L-Link or equivalent. 6. 25 mils minimum separation between layers. Top & bottom layer have extra power & ground tracks in parallel with layer 3 power & ground plane. There are three output stage transistor mounting schemes. Vertical, horizontal, and underneath the board. There are surface mount pads on the top and bottom of the board and two sets of holes for soldering. Supports up to 750 mil diameter capacitors using a 300 mil lead space. There are 14 capacitor footprints per voltage rail and also supports 3 capacitors for the VAS per rail. reliability, i.e. both pins on the speaker output are shorted on the PCB. A similar setup for the power input is used. Resistive Load: 120/277 VAC 30 ampere per contact. 28 VDC 20 ampere per contact. Supports a standard terminal block of� 650 mil x 475 mil, 200 mil centers. 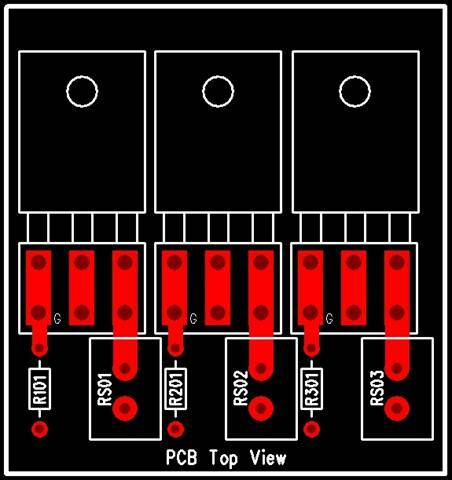 Large capacitor PCB footprints to allow the use of signal path polypropylene capacitors where applicable. Supports radial source resistors with 200 mil lead space to save PCB real estate. 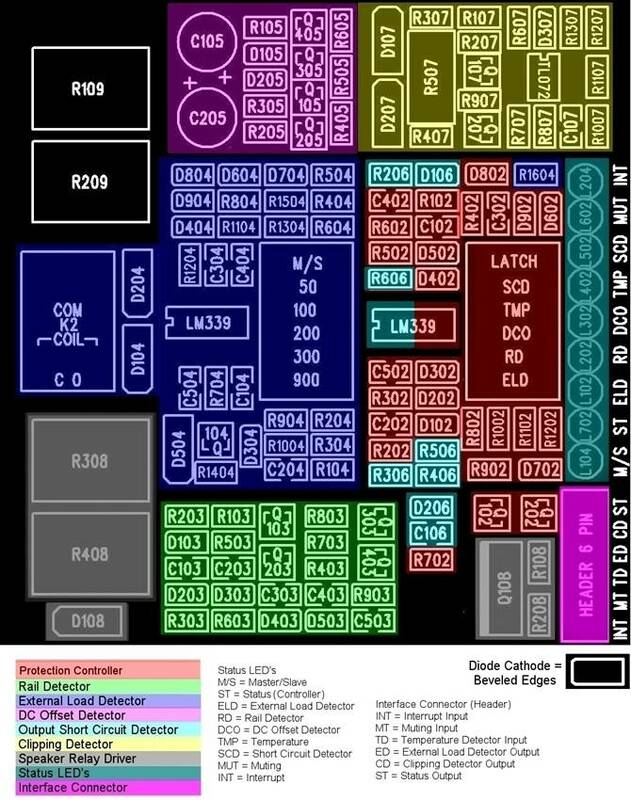 The protection circuits are 100% surface mount devices to save PCB real estate. This connector is used to provide inputs/outputs for interfacing such as controller status output, clipping detector output, external load detector output,� temperature sensor input, muting input, interrupt input. The first stage is what I call an asymmetrical balance input error amplifier.� It is a design which allows only one single differential stage and yet has the ability to accept a balanced input source.� An unbalanced source can be used if either the inverting or non-inverting input is tied to signal ground.� Now I will explain how each device in the stage works together.� Q1, Q2, R6, R7, R8, R9 form the main differential error amplifier which then has its collectors connected to a cascode load.� Q3, Q4, R10 and ZD1 form the cascode stage which provides a constant 14.4 volts on the collectors of Q1, Q2.� Q5, R11, R12, ZD2 and C6 form a constant current source which supplies 1.5 milliamps to the first differential stage.� These modules form the first stage of the amplifier and basically set up how the whole amplifier is biased from front to back. This next stage provides most of the voltage amplification that the next stage needs to drive the output stage to full power.� Q6, Q7, Q8, Q9, R16, R17, R18, R19, C10, C15, C16, C2901, C3401 for the second differential voltage amplification stage.� Q6 and Q7 form what is known as a current mirror load for the second differential stage and basically force this stage to share the current supplied from R36, which is about 8 milliamps.� The remaining components, namely the capacitors C11, C12 provide local frequency compensation for this stage. As the name suggest Q10, Q11, Q12, R27, R25, R26, R22, R20, R21, C14, ZD3, ZD4, form the bias and buffer stages.� Its main purpose is to provide the mosfet gates with a stable and compensated supply voltage and buffer the voltage amp stage from the high gate source capacitance.� Which would without this stage cause the frequency response and slew rate to be very poor indeed.� The down side of this is the extra stage does introduce and extra dominant pole into the amplifiers feedback loop. Once again as the name suggest this stage converts the voltage developed in the VAS and provides all the amperes needed to drive 8 or 4 Ohm loads.� 2 Ohm loads are possible for several minutes at a time.� In fact, I have tested the 1KW amplifier to over 1600 watts RMS into 2 Ohms.� But this would not be recommended as a long-term load at all.� As it does exceed the SOA figures of the output stage. Note: Model 2800 with 28 output transistors and robust heatsinking should be able to drive a 2 Ohm load continuous tone testing.� It may even drive a 1 Ohm load playing music, not continuous test tones. The power supply components for this amplifier are as follows and are expressed for one channel or one power module only.� 1 x toroidal transformer with a core rating of 1KVA.� Primary windings are made to suit your local mains supply, e.g. : for Australia one single primary winding with a 240 VAC rating.� For USA, 110 VAC, 115 VAC and I believe there is a 220 volt AC mains supply in some areas of the United States.� For the UK it would be 220 VAC to 240 VAC. The secondary windings are as follows. One 400 volt 35 ampere bridge rectifier. 2 x 4.7K 5 watt ceramic resistors. Ideal capacity would be 40,000 uF per voltage rail. For stereo or dual mono operation the following power supply will be required. 1 x 2KVA toroidal transformer with a core rating of 2KVA. 2 x 400 volt 35 ampere bridge rectifier. 4 x 10,000 uF 100 volt electrolytic capacitors. programmable settings of the Protection Controller and the External Load Detector that need to be set. circuit board to configure the Controller.� See Figure 1 for the location of the DIP switch. 1.� Determine which protection circuits you want enabled and turn ON the appropriate DIP switches , S102 - S502. ���� If you want all the protection circuits enabled, simple turn ON all the switches S102 through S502. ���� DIP switch S602.� Latch mode requires the user to turn OFF the amplifier� to reset faults, Loop mode doesn�t. ���� In Loop Mode, the Protection Controller will restart when the faults clears and return to normal operation. 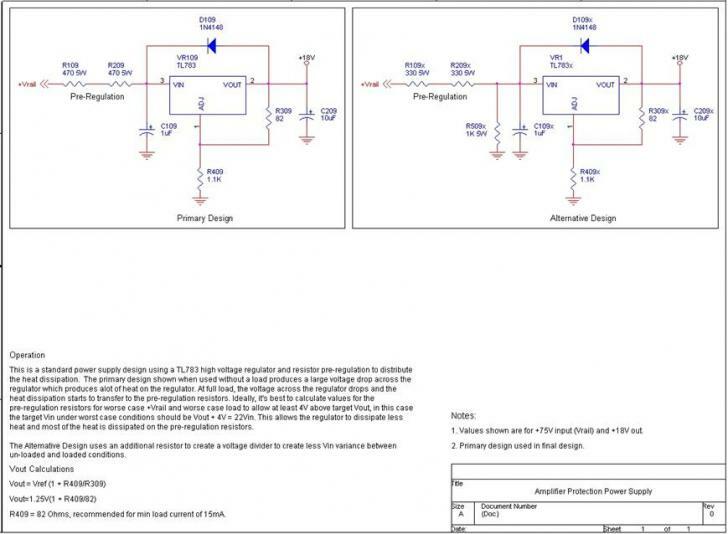 Refer to the Amplifier External Load Detector section for reference.� Use DIP Switch labeled S2 on the printed circuit board to configure the External Load Detector.� See Figure 1 for the location of the DIP switch. ��� sequence of switches S104 � S504. ��� stops functioning 2 seconds after the amplifier is powered on. 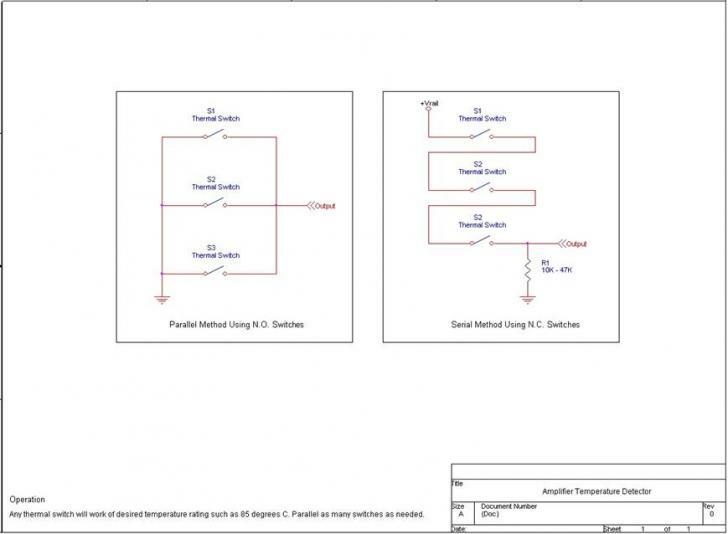 ��� Connector and see Figure 1 for additional reference of pin locations. features that you access through this connector. See Figure 1 for additional reference of pin locations. The design methodology chosen for amplifier and speaker protection is based on using a high current relay between the amplifier�s output and the speaker using the normally open relay contacts.� The relay must be turned on to connect the speaker to the amplifier. When a fault occurs, the relay will turn off and disconnect the speaker from the amplifier. Disconnect the speaker from the amplifier when a fault occurs to protect the speakers. Some audiophiles claim that relays may have a sonic signature typically due to poor electrical contact between the amplifier and the speaker.� The relay chosen and the configuration used should alleviate the fear of using relays even for the most critical audiophiles. The other concern with using a speaker relay is voltage may arc across the relay contacts causing contact failure. This occurs during a high voltage DC offset failure or similar failure of the amplifier.� The design uses two diodes on the normally closed contacts to shunt any high voltage arcs to ground. It�s not a 100% solution but it may prolong relay contact life.� Worse case, if there is a severe amplifier failure and the relay is damaged in the process of saving your $10,000 speakers, the cost to replace the relay is $10, a better solution than replacing a speaker system. There are five detectors, Rail Detector, External Load Detector, DC Offset Detector, Short Circuit Detector and an external input for temperature detection using a thermal switch or equivalent. Included is voltage rail fuse holders on the printed circuit board capable of 30A each. The Rob Elliot clipping detector is used in this design for visual indication when the amplifier is clipping the audio signal.� It doesn�t interact with the Protection Controller. There are two banks of DIP switches, one for the Protection Controller and one for the External Load Detector to select desired modes of operation. There are nine system status LED�s. There is a 6 pin interface header used for input/output functions and ease of wiring. It�s function is to determine when to turn on/off the speaker relay using data it receives from the detectors/inputs. 1.� Provides an 8 second delay before turning on the speaker relay to protect the speaker from turn-on transients. 2.� Receives pass/fail status from all the protection detectors. 3.� Controls the speaker relay. 5.� User can enable/disable each detector via a DIP switch bank. 2.� External Load Detector Input. 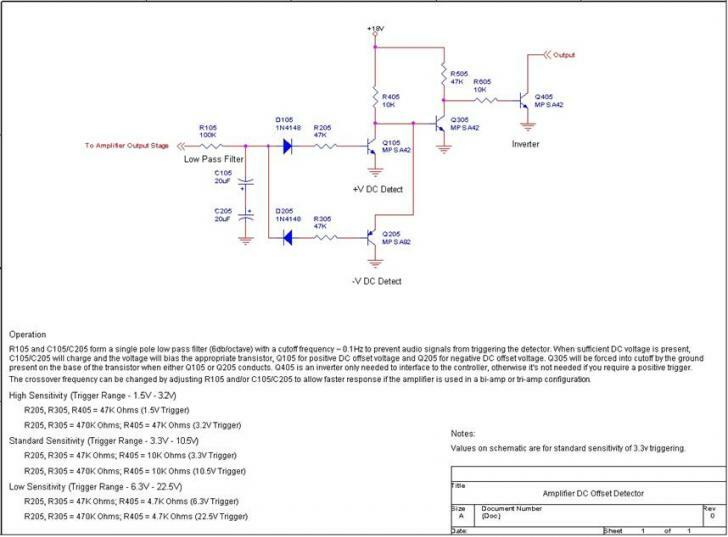 3.� DC Offset Detector Input. 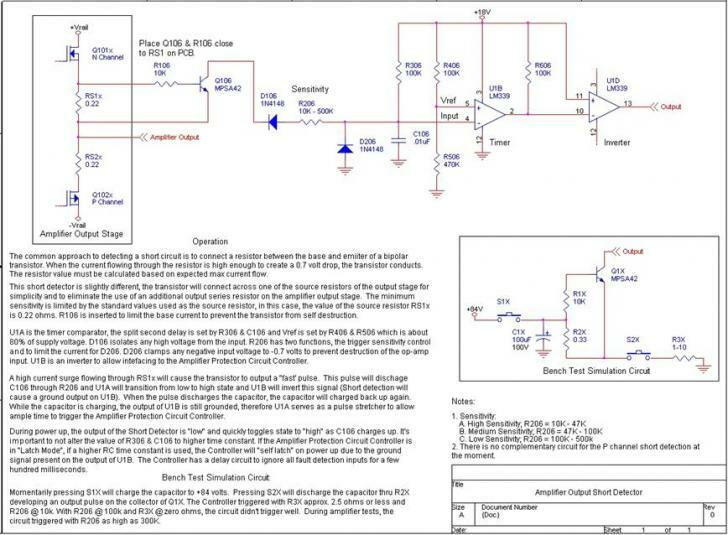 4.� Short Circuit Detector Input. The Protection Controller has a DIP switch bank (S1 on the circuit board) to enable/disable individuals Detectors. S102 ON = enable the External Load Detector. S202 ON = enable the Rail Detector. S302 ON = enable the DC Offset Detector. S402 ON = enable the Temperature Detector. S502 ON = enable the Short Circuit Detector. S602 ON = Latch Mode, OFF = Loop Mode. Protection Controller will restart when the faults clears and return to normal operation. There are nine status LED�s to help the user in determining any system faults.� The LED�s are not latched, therefore if a fault clears the LED will turn off automatically. 1.� Six Detector LED�s (Red), one for each Detector.� When a Detector sends a fault signal, the LED will light up. 2.� Status Output LED (Green). The LED with light up when the speaker relay is turned on. 3.� Master/Slave LED (Blue).� The LED with light up when placed in the Slave Mode.� Used by ELD. 4.� Interrupt LED (Yellow).� The LED with light up when the amplifier channel is being interrupted.� Used by ELD. Use the interface header to wire any inputs or outputs as needed. 1.� Status Output (ST).� This is a ground output when �armed�. ���� to power supply ground. 3.� External Load Detector (ED).� This is a ground output when a fault is detected. 4.� Temperature Switch Input (TD).� Use a ground signal to indicate a fault. 6.� Interrupt Input (INT).� Use a ground signal to interrupt the External Load Detector. The External Load Detector (ELD) monitors the speaker terminal for an abnormal resistive load during the initial amplifier power on sequence to detect wiring errors, shorts, or incorrect speaker load. The ELD is NOT directly connected to the speaker terminal, it uses the speaker relay normally closed contacts to sense the load present only when the relay is turned off.� When the speaker relay turns on, the ELD is disconnected from the speaker terminals.� The user determines the triggering threshold by programming the DIP switch (S2 on the circuit board). The ELD is a comparator that measures the resistive load on the amplifier�s speaker terminals in reference to ground and compares this value to the threshold resistance value that the user programmed.� If the load present at the speaker terminal is lower in resistance than the preset value, an error output will trigger.� For bridge mode operation and additional measurement is made between both positive terminals of the two channels.� Anytime the speaker relay is off, the ELD is measuring the load on the speaker terminal. DIP switch bank (S2) on the circuit board is used to program the ELD, specifically switches S104 through S504. S604 is used for bridge mode operation to set the Master/Slave function of the ELD. 1. The comparator Vin resistor is 1K Ohms (R704) in series with the Rload (load across speaker terminals). 2. 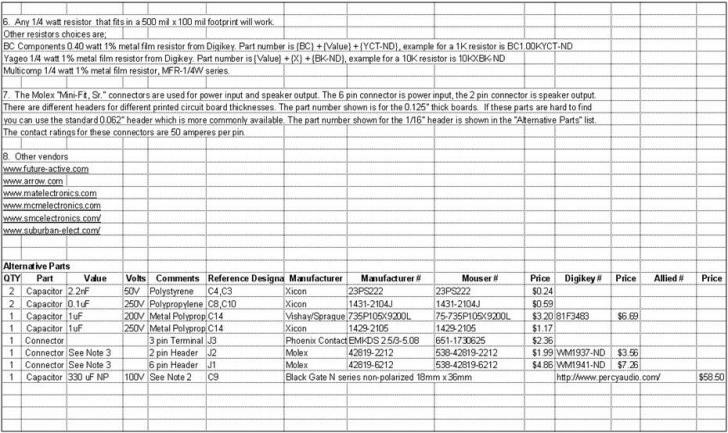 The comparator Vref resistor is 10K Ohms (R604) in series with the resistance values shown on Table 1. 3. The DIP switch resistors were scaled upwards in Ohms by a factor of 50 times to allow better precision, i.e., Threshold x 50 = Equivalent Detector Ohms. 1. To enable the ELD, S102 must be set to the �ON� position. 2. Set the Master/Slave switch to 'Master' on the amplifier channel. 3. Set the triggering threshold that you desire as shown in Table 1. During the amplifier power on sequence, the ELD will immediately measure the resistance between the speaker terminal in reference to ground. If it measures less resistance than the programmed threshold, the ELD will trigger an output ground signal. In order for the ELD to function correctly in this configuration, you need to jumper two wires across both channels for communications. These two wires do not need to be removed if you are in �Normal Operation�.� Refer to the section below called �Bridge Mode Wiring� for details. 1. Bridge Mode Wiring for inter-channel communications must be enabled. 2. To enable the ELD, S102 must be set to the �ON� position. 3. Set the Master/Slave switch to 'Master' on one amplifier channel, set the other amplifier channel to �Slave�. 4. Set the triggering threshold that you desire as shown in Table 1. Due to the loading effects of both amplifier channels, the ELD will only trigger when the measured load across both speaker terminals is � of the programmed threshold value.� Example, if you program the ELD for 1 ohm, in bridged mode only, if it measures less than 0.5 ohms between both speaker terminals, it will trigger. For measurements from speaker terminal to ground, it will function the same as �Normal Operation�, it will trigger if it measures 1 ohm in reference to ground. There are two types of Bridged Mode tests. 1. Self Test � The speaker terminal to ground is measured. This test is the same as �Normal Operation�. 2. Bridged Test � If Self Test passes, the Bridge Mode testing will occur ~2 seconds after Self Test.� The load across both speaker terminals (positive terminals of both channels) is measured. To measure the load across two floating terminals, the Slave channel will enable the Bridge Mode circuit which forces a low current ground signal to it�s positive speaker terminal to allow the Master channel to measure the load in reference to the ground present on the positive speaker terminal of the Slave channel. If Self Test passes, it enters Bridge Mode testing ~ 2 seconds later. Slave channel Bridge Mode relay turns on forcing a low current ground on the positive speaker terminal. Master channel measures the load across both speaker terminals. 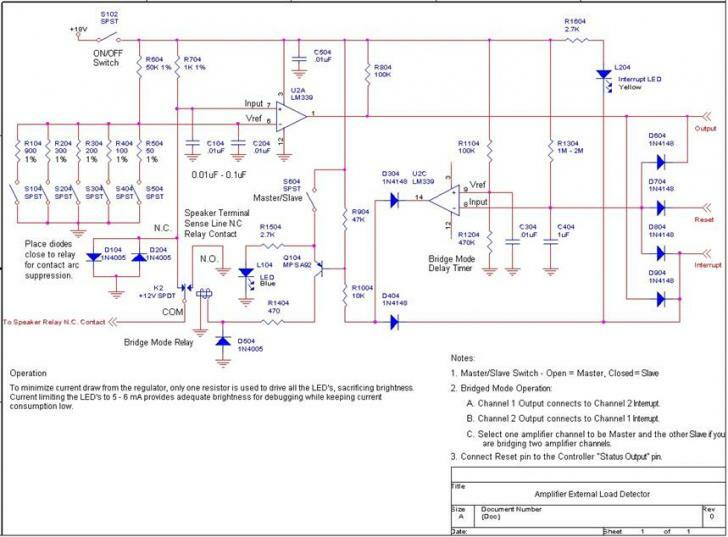 If Master channel fails, it will force a failure signal on both amplifier channels to prevent both amplifier channels from arming. Note: If Self Test fails, the master channel will interrupt the Slave channel and force the Bridge Mode relay on the Slave channel to turn on. This is a� �don�t care� situation because Self Test fails. 1. Jumper a wire from channel #1 �External Load Detector Output� to channel #2 �Interrupt Input�. 2. Jumper a wire from channel #2 �External Load Detector Output� to channel #1 �Interrupt Input�. 3. One channel must to be set for 'Master' mode and the other channel must to be set for 'Slave' mode. 1. These two jumper wires allow interrupt communications between both channels. 1. 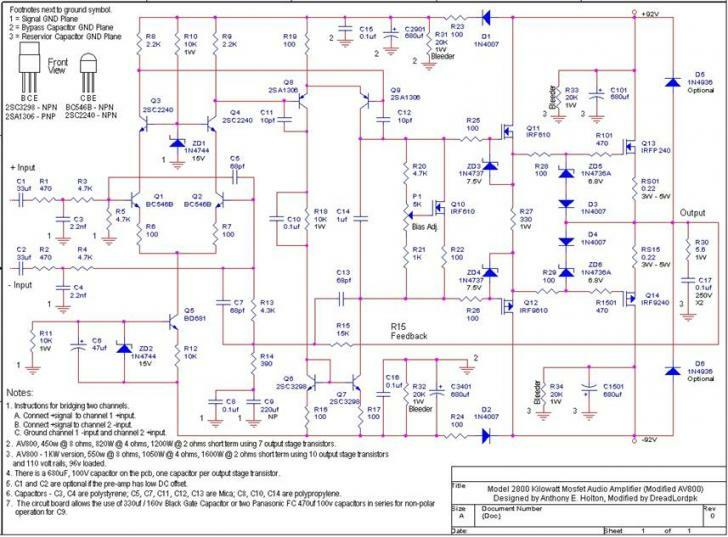 Reset � Turns off the Bridge Mode circuit including the Bridge Mode relay. 2. Interrupt -� Force the Bridged Mode relay to turn on immediately or force it to stay on and reset the delay circuit. 1. The relay will turn off immediately. 2. The Slave channel will redo the self test. 3. If self test passed 2 seconds later, the delay circuit enables the relay and the Master channel repeats the test across both speaker terminals. 1.� One of two rail fuses blows.� The Rail Detector may trigger when both fuses blow. 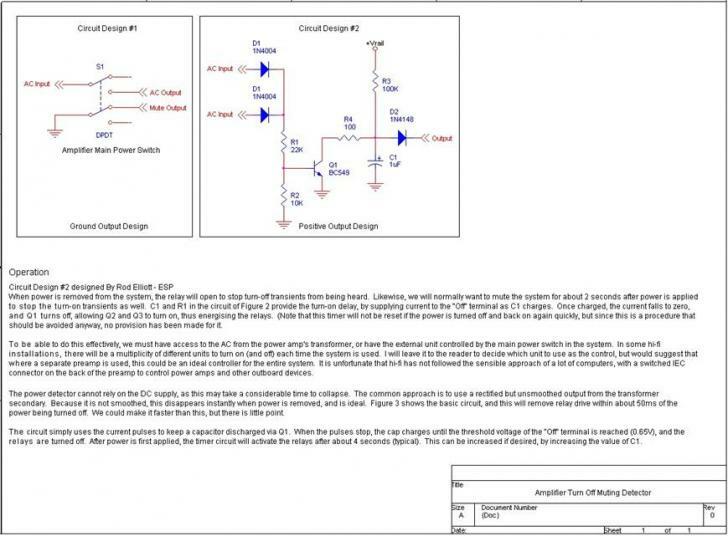 2.� If one transformer fails in a dual transformer power supply design. 3.� If the transformer is unbalanced or not loaded equally. Turn off muting is a bonus feature that may function depending on your amplifier power supply design.� When the amplifier is turned off and the power supply discharges quickly, the Rail Detector may detect the rapid discharge and trigger a fault condition that turns off the speaker relay which is a desirable feature to prevent turn-off transients reaching the speakers.� Another method to achieve turn off muting is to create a condition that causes one power supply rail to discharge faster then the other rail. The Rail Detector will detect the voltage differential when exceeding the threshold and trigger a fault condition. The Short Circuit Detector is a classic design used in the audio industry, but implemented slightly different than conventional means. Normally an output series resistor is added between the amplifier�s output stage and speaker and the voltage across the resistors is senses for over-current conditions.� Adding this series resistor was rejected for �sonic reasons�.� An alternative solution was to tap the sense line across on of the output transistor�s source resistor. In theory, all transistors should be sharing current equally and if an overload condition occurs, excess current with also flow thought the source resistor and trigger a fault condition.� The sensitivity is programmable via a single resistor. 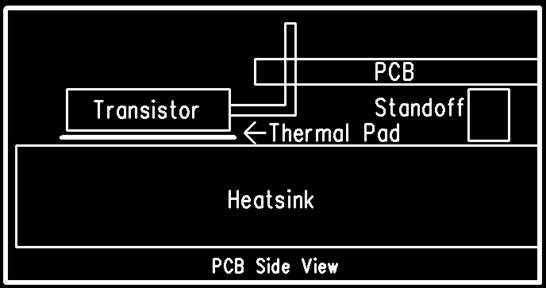 Temperature Detectors are not integrated into the design, but an input is provided to connect whatever temperature detection methods you prefer.� A simple thermal switch (or switches) can be mounted on the heatsink and connect the switches to the temperature detector input wire on the 6 pin Interface Connector. The industry standard for component reference designator �prefix� is typically �R� for resistor, �C� for capacitor, �D� for diode, �Q� for transistor, �J� for connectors, etc. followed by a number (suffix) to identify the specific component. Example, R1, R2, R3, etc. The reference designator scheme used is this design is different.� The prefix is the same, but the suffix is different to identify which components below to a particular circuit.� Example, the suffix �02� represents the Protection Controller.� Any component with suffix �02� belongs to this circuit.� The audio amplifier section use the industry standard method except for the output stage transistors and power supply capacitors� See Table 2 for the list. Industry Standard Suffix, i.e., R1, R2, R3, etc.� The output stage transistors and power supply capacitors use �01� suffix, i.e., Q101, Q201, Q301, Q401, C101, C201, C301, C401, etc. �02� suffix, i.e., R102, R202, R302, etc. �03� suffix, i.e., R103, R203, R303, etc. �04� suffix, i.e., R104, R204, R304, etc. �05� suffix, i.e., R105, R205, R305, etc. �06� suffix, i.e., R106, R206, R306, etc. �07� suffix, i.e., R107, R207, R307, etc. �08� suffix, i.e., R108, R208, R308, etc. �09� suffix, i.e., R109, R209, R309, etc. 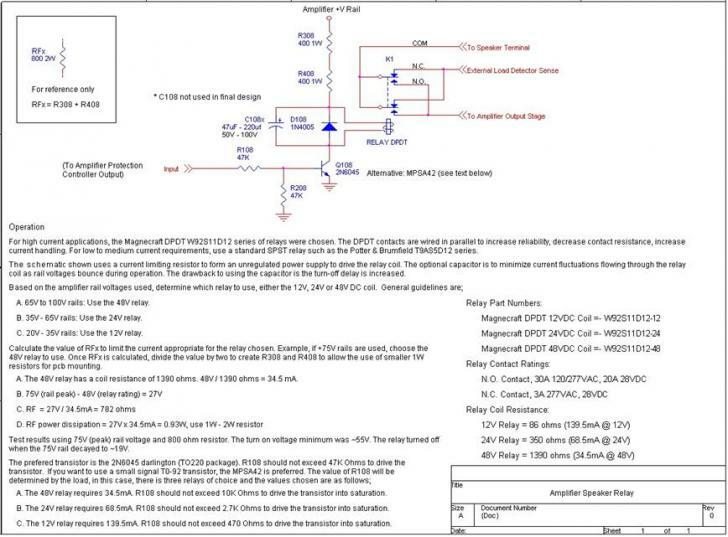 The recommended component assembly order is shown in Table 3.� Install and test each section one at a time for ease of debugging problems.� Refer to the parts list and schematics at the bottom of this document.� Figure 1 below shows the component placement map for the protection circuits located on the right side of the printed circuit board, the SMD components.� For a more detailed explanation, see the installation guide below. This is the positive power supply voltage rail fuse.� Insert a fuse on both clips and solder the clips their location. This is the large speaker relay in the center of the printed circuit board. This is the power supply input, +V, -V, and ground.� Solder the 6 pin Molex connector in this location. This is the speaker output connector.� Solder the 2 pin Molex connector in this location. The power supply is approximately +18v. Figure 1 - GRAY area. Figure 1 - RED area. Figure 1 - TEAL area. Figure 1 - CYAN area.� Q106 & R106 are the sensing components located next to Q1401 on the upper right location of the pcb. Figure 1 � Blue area. Figure 1 � GREEN area. Figure 1 - Light PINK area. Figure 1 - YELLOW area. Figure 1 - PINK area. Left side of the printed circuit board. Resistors have no polarity and can be installed in any orientation. The SMD capacitors are small in value and have no polarity and can be installed in any orientation.� The larger capacitors do have polarity indicated on the schematic and labeled with a + sign on the printed circuit board.� For example, if you look at figure 1 you will see capacitor C105 and C106 which has a plus sign (+) next to them indicating the installation orientation. All diodes including zener diodes have polarity and must be installed in the correct orientation.� Zoom in on Figure 1 and you will see the printed circuit board silkscreen diode orientation.� The diode prefix is labeled �D� and the symbol has two beveled edges to represent the diode cathode.� You must place the diodes in the correct orientation for proper function. All transistors have three leads and must be installed in the correct orientation.� Bipolar transistor leads are base, emitter, collector.� Mosfet transistor leads are gate, drain, source.� For SMD transistors, the installation is easy because there is only one way the transistor will line up with the SMD component pads.� For non-SMD transistors, the silkscreen will indicate �B�, �C�, �E� for the larger bipolar transistors.� The output stage transistors are just labeled �G� for gate. The small signal transistors in the T0-92 package have not markings, but you can look at the silkscreen picture for correct match. 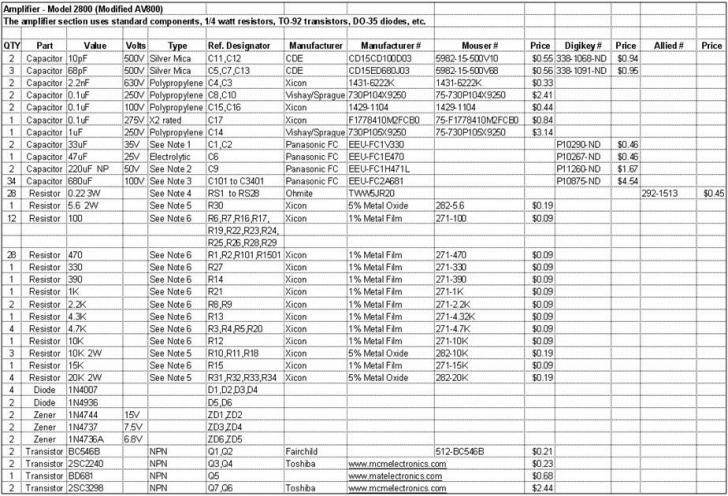 Reference the parts list, schematics, and Figure 1 for component values and installation locations.� It�s easier to install the surface mount devices (SMD) first then install the larger components.� You will need a fine tipped soldering iron, fine awg solder, liquid flux and tweezers to hold the device or any other method you prefer.� One technique to solder SMD devices is to place a tiny drop of flux on the SMD pad, apply a little solder to the pad using the soldering iron to coat the pad with a thin layer of solder.� Place the SMD component on top of the �pre-tinned� pads and hold the device with the tweezers and heat up the intersections where the component meets the pad causing the soldering iron to reflow the solder. The fuse clips are beryllium copper rated for 30 amperes.� To get the best electrical connection install the fuse clips on the fuse and position the clips for best alignment.� Install the fuse/clip assembly on the printed circuit board.� Use a high wattage solder iron. This is the large speaker relay located in the center of the board.� It�s a DPDT relay with parallel contacts for high current capability and contact redundancy for improved reliability.� Use a high wattage solder iron. Molex receptacle, one set for the positive voltage rail, one set for the negative voltage rail, and one set for ground. If you chose not to use the Molex connector, you can insert and solder a large diameter wire in the largest hole provided on the printed circuit board.� Use a high wattage solder iron. This is a 2 pin connector used for the speaker output connector.� Both pins are shorted together on the printed circuit board.� The �two pin� parallel design allows a higher current capability up to 100 amperes and also provides contact redundancy to improve reliability.� If you chose not to use the Molex connector, you can insert and solder a large diameter wire in the largest hole provided on the printed circuit board.� Use a high wattage solder iron. Install the protection circuit power supply.� Temporarily mount a TO-220 heatsink or equivalent to the voltage regulator for testing purposes, then later you can remove the heatsink and mount the voltage regulator to the main heatsink used by the output stage transistors.� Plug in the Molex connector and turn on the power supply.� The voltage regulator should output approximately +18 volts +/- 1 volt. Note: R308 and R408 are 1W resistors. Note: R104 � R704 are 1% tolerance. Note: Clipping LED L107 is mounted on the chassis and use the interface connector for wiring. Install a standard 6 pin Molex header, 100 mil centers. Install all the components except for the output stage transistors which will be install last after testing. Minimum 3 watt.� Radial mount. C1, C2� (optional) - Some people prefer no input signal capacitors if the preamp has low DC offset.� Install two jumper wires on the C1 & C2 locations if the capacitors are not used so the input signal passes through. Electrolytic capacitor is only viable solution due to space restrictions on the pcb. 250 Vac X2 rated capacitor. A. Install a 220uF non-polarized in location C9. If C9A & C9B is installed, jumper a wire across the extra C9A & C9B pads. Install these last after testing. heatsink that the output stage transistors are mounted to for thermal tracking. resistors to verify that the amplifier is ok.� If the amplifier passed these checks, power down the amplifier and remove the 10 ohm resistor. Offset voltage at R15 should be close to 0 volts, but can be as high as 100mV. 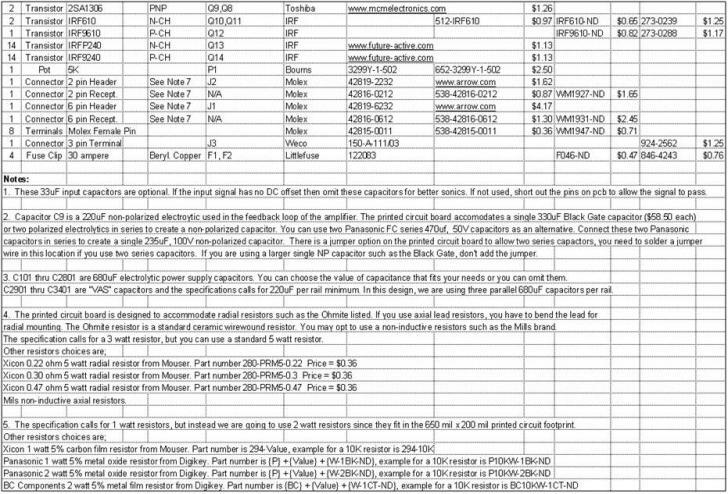 characteristics to P-channel characteristics.� Refer to the section on �Matching Mosfet Transistors�. 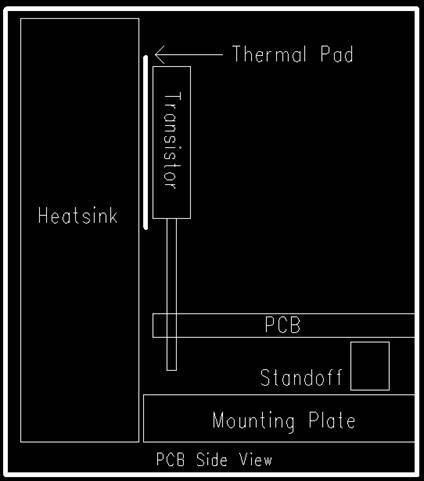 the white thermal compound to both sides of the insulator to transfer the heat from the transistor to the heatsink. pin (that connects to the tab) and the heatsink. 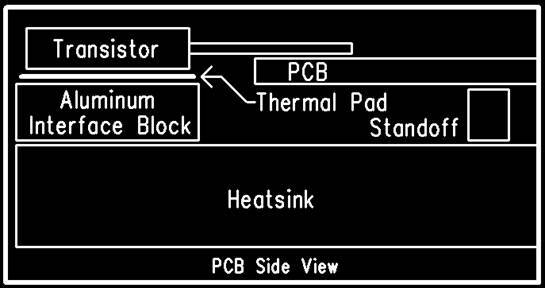 See Figure 2.� The printed circuit board will mount on top of the heatsink using 1/4� standoffs minimum to provide ample clearance to avoid the bottom soldered leads from shorting to the heatsink.� The transistor leads lay flat and are soldered on top of the printed circuit board pads.� Use an aluminum interface block to couple the transistor to the heatsink. Note:� There two sets of holes for the transistor. You can place the transistor further underneath the board by using the second set of holes. 1.� The drain pin on each output stage transistors are not shorted to the heatsink or block used for mounting. 2.� The power supply wiring is the correct polarity. ���� 4.7K ohms is measured across the gate and drain pins of Q10. 4.� Insert an 8 ampere fuse in each fuse holder on the printed circuit board, labeled FUSE 1 and FUSE 2. ���� the lead� of R15 closest to the relay.� Connect the black probe of the meter to ground. the case, turn off the amplifier and debug your assembly. 2.� Turn on the amplifier and slowly adjust P1 to achieve an absolute value reading of 18mV. When using this type of Mosfet in the AV800 amplifier is strongly recommended that the output stage devices be matched.� As it has been found that is this is not done then there is no guarantee that they will share the current under load.� The source resistors provide only a bit of local feedback and don�t in any ways force the devices to current share. 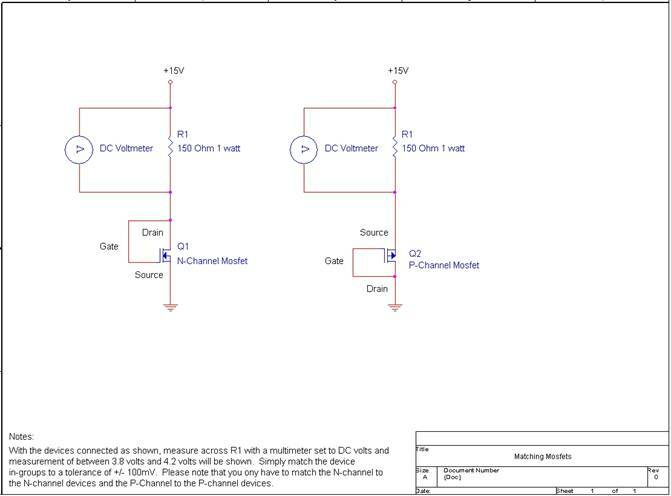 P-channel devices.� With the devices connected as shown, measure across R1 with a multimeter set to DC volts and measurement of between 3.8 volts and 42 volts will be shown.� Simply match the device in-groups to a tolerance of +/- 100mV. The test is simple and requires a power supply, a resistor, and a DC voltmeter. Figure 5 shows the test hookup for N- and P-channel types. The supply source resistance (R1) is nominal, and is found from I = (V - 4)/R1. Consistency is the most important thing here. The given voltage is 15 and, adjusting for about a 4V VGS, we will see about 11V across the resistor. We are looking for as much matching of the input Mosfets as possible at a current of 5mA. For this test, we use an R1 value of 2.2kohm. Measure the voltage between the gate and the source. Write it down on a piece of masking tape or a sticky label and place it on the part. Keep in mind the caveats about electrostatic discharge: touch ground before you touch the parts. We also measured the transconductance by taking another reading for each device at a higher current (0.5A), just to see what kind of variation we got. The transconductances measured from a low of 1.19 to a high of 1.56, with the average at about 1.35. Within this amplifier's general operating curve, each output will vary its current by about 1.3A for every volt of its VGS change. For 12 devices in parallel, we expect about 15A for each such volt. Remember that each of these devices is rated at 75W on a cold heatsink, and maybe 50W on a hot sink. We are only going to bias them to about 8W each, so they're not going to break from a little unequal distribution. Nevertheless, we like to see the load shared, and recommend that you group the outputs by VGS as closely as possible. Matching within 0.2V will work, and O.1V is even better. Within a population of 150 transistors, you can easily get 12 sets matched to O.1V VGS at 200mA. Model 2800 single channel and bridge mode configuration. 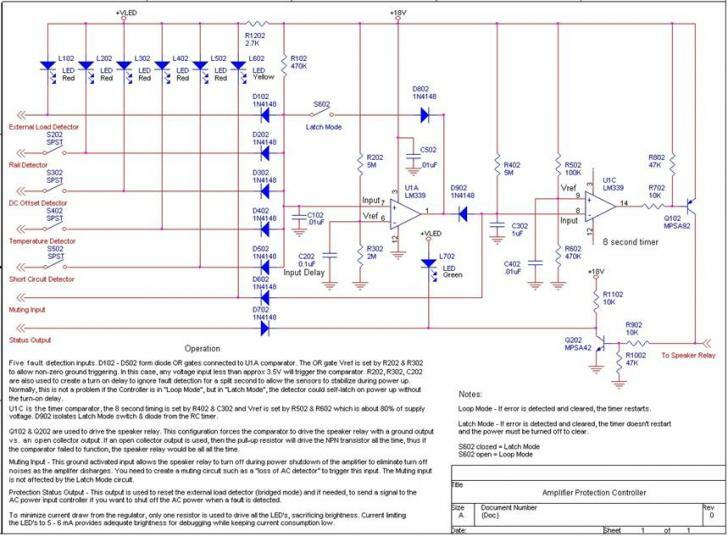 Model 2800 schematic (modified AV800).� Reference designators do not match the original AV800 schematic.